In a delightful conversation with our esteemed alumnus, Shilpy Gargmukh, do we realise the true meaning of not giving up and clinging on to the slightest of hopes. Shilpy, now the proud owner of the title of ‘First Lady Officer of Territorial Army’, was never so ambitious, yet always full of ambitions. Right from the beginning, she has been a sparkle in academics. Coming from Katihar, Bihar, Shilpy completed her 10th boards on a high, becoming the topper of Navodaya Vidyalaya. Later she finished her intermediates from DPS Bokaro with flying colors. She then joined BIT with Chemical Engineering and took a placement at TCS. As evident from the conversation, one aspect is clear for sure – she has left no stone unturned in the short journey of life. Looking back at her profile, it seems as dynamic and diverse as it could get. From representing Navodaya in the Nationals twice in Basketball to learning classical music, she has had an urge to achieve everything possible in life. After graduating, she joined TCS Hyderabad, and within a couple of months into the company, she realised that it was not what she wanted to do. Being a Chemical engineer, programming and testing never lured her. She started appearing for various government and PSU examinations. Shilpy had her own share of failures. She was rejected from organisations like BARC, ISRO and SAIL. But as they say, success comes to the persevering. She was finally selected at ONGC and The Indian Air Force. Shilpy chose ONGC and is more than satisfied with the work culture, environment and her peers. 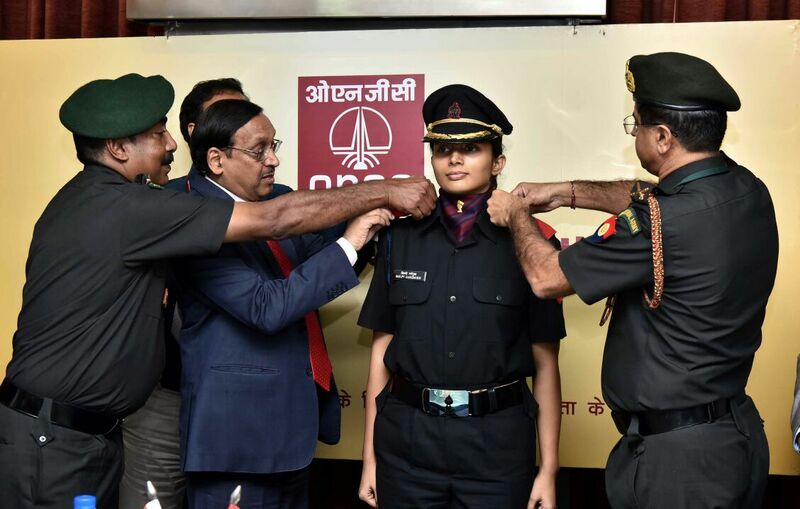 It is only in ONGC that she got to know that certain organisations and companies allow their employees to join the territorial army. Being from a family with a strong background in defence (one of her siblings is a fighter pilot and another holds the rank of a Major in the army), Shilpy saw this opportunity as the ideal one for her to get closer to dream of serving the country. Territorial Army is second line of defence after regular army that receives military training and renders its services to the nation at the time of emergency. Shilpy underwent all necessary examinations and scrutiny of being a Territorial Army Officer, and finally after a dedicated toil, accomplished the title of one. This achievement instilled in a new confidence in her and gave her the courage to not look back any bit. She added that during her SSB interviews of induction into Air Force, she was privileged to have met some of the brightest, bravest and talented women of the country. This proved to be a turning point in her life. In the words of Shilpy Gargmukh, “Follow your dreams. The path might not be opportune, but the result shall declare itself like glittering gold.” Greats are a source of epiphany, but only to those who are prepared to counter the dark.